Fox News = Altright, Right (White) Wing, Tea Party, well Tea Party was active when Obama was in, NRA, Tiki Torch Klan, White Supremist Trump Station. And their hate speech henchmen are womanizers. I could go on. Turn off your TV in either case (CNN or Fox) and research information for yourself. You’ll find that both sides are full of it. Stop being lazy by feeding on what the TV tells you. If Obama did or was accused of a fraction that this idiot is accused off ……………..
a firing every week, paying off Stormy and Puttin has him wrapped round his finger (first time in American Presidential history) and lies like S#!+ and still not impeached, and they wanted to hang Obama for nothing. Why does it say under the picture of the Bermudian men, “Men wearing romper suits & skirts this summer”? Is this just a bad-timed still? Or were they poking fun at us too? And furthermore, what is a “romper suit”? A suit for romping around it? Do business men romp? I always laugh when I remember Saddam Hussein threatened Bermuda if we sent him any Bermuda shorts, and someone sent him a pair. Lol! Anyways, I thought we had Bermuda shorts because if you are in the water and want to get your dinghy out you wont get your pants wet. 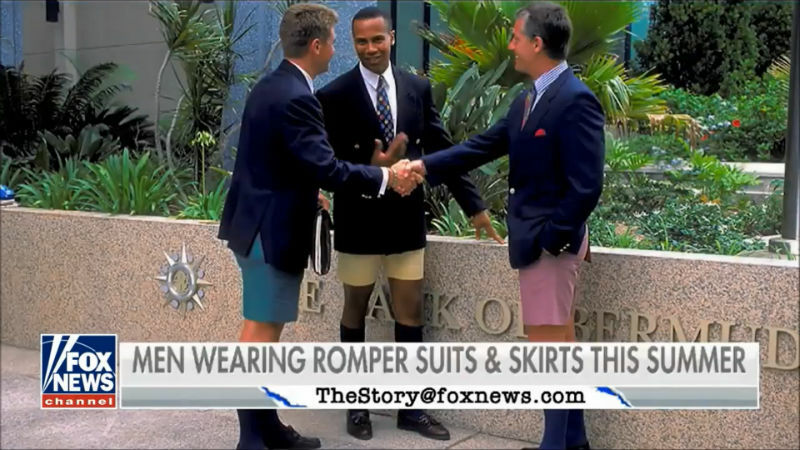 Just a bad coincidence that that headline was up when the Bermuda shorts were displayed. I think the rompers were those things that threatened to become a thing last year. Some people were wearing them at Cup Match. Hopefully that trend has died off quickly. Yeah those things are ugly as sin. I can’t imagine why anyone would want to be seen in public in one of those things. I thought we had Bermuda shorts because if you are in the water and want to get your dinghy out you wont get your pants wet. You can get your dingy out no matter what you are wearing even a romper suit works. We don’t judge. It was birthed from English soldiers. So was Bob Marley, and ya point is? You’re comparing yourself to Bob Marley now? No, just aknowleging that British Officers prefered a lil spice in there life which produced greatness. I think his point was to say “what is your point?”…. get my point? Congratulations ! You’re finally right about something. Give that kid a sticker! We all know you are part of de “Make America Great Again” movement, but when did America stop being Great? And de Obama years dont count. Let them laugh – its free publicity. It takes a real Bermuda man to wear Bermuda shorts especially overseas representing our island. Bermuda men rock Bermuda shorts. Bermuda formal, blazer, shorts (any colour), knee socks & dock siders. Wear that combo & there is no need to carry a sign or flag. The world knows where you are from.